Some of my favorite things have come from "across the pond"...the Beatles, the Rolling Stones, Led Zeppelin, Jude Law, Christian Bale. :awe: You get the idea! Now, Peppa Pig has also jumped across the pond to delight preschoolers everywhere with her award-winning television show. Peppa Pig is a top-rated animated series in the U.K. geared for preschool-aged children. What's unique is that each episode is only about 5-minutes long, instead of the typical 15-minute format of most children's shows my daughter watches. Peppa Pig follows the daily adventures of Peppa, a lovable, energetic little piggy who lives with her brother George, Mummy Pig and Daddy Pig. My entire family has long enjoyed the antics of Peppa Pig and her clan and now, thanks to the new Peppa Pig merchandise from Fisher-Price, my daughter can be delighted by Peppa any time! Peppa Pig is a show that revolves around Peppa, a little girl pig, and her family and friends. Each of her friends is a different species of mammal with cute names like Emily Elephant, Rebecca Rabbit and Zoe Zebra. Episodes tend to feature everyday activities such as attending playgroup, going swimming, visiting their grandparents, going to the playground or riding bikes. Because Peppa lives in the U.K., she speaks with a sweet and engaging British accent. She loves playing games, dressing up, going on trips and jumping in muddy puddles. Her adventures always end happily with loud snorts of laughter! My daughter truly enjoyed Peppa Pig and the show's certain style of lighthearted, laugh-out-loud storytelling. I, on the other hand, genuinely appreciated the show's emphasis on family, friendship, fun and humor. Peppa Pig is a delightful show for the entire family, because my family finds the English humor and different words they use quite humorous. For instance, any time someone on the show breaks something electronic, they always ask Daddy Pig to "mend it". All he knows how to do though is turn the item off and then turn it back on. This always works and we laugh then when the announcer says that "Daddy Pig mended the computer". Also, when Peppa's family goes to the grocery store, they use "trolleys" instead of shopping carts and they go to the local pool dressed in their "swimming costumes" instead of bathing suits. Of course, I always get a big kick out of my southern belle of a daughter trying to imitate Peppa and speak with a British accent. 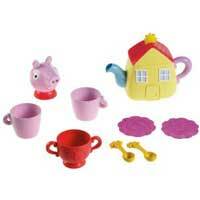 This sweet tea set includes everything you need for a Peppa-themed tea party: a tea pot shaped like Peppa's house and two pretty cups saucers and spoons. Lift your tea cup for a fun surprise - a little piggy snout on the cup's bottom lets you look just like Peppa when you sip your tea! This 60-minute compilation features 10 "peppasodes" from the award-winning series, as aired on Nick Jr., including fan favorites such as "Muddy Puddles" and "Camping". If your little one is also a fan of Peppa Pig, like my toddler, then be sure to check out the brand new selection of Peppa Pig merchandise available at Toys 'R' Us. Keep up with Peppa Pig and all the latest news by liking their Facebook page and check your local listings for air times on Nick Jr.
Have some family fun time with the Fisher-Price Peppa Pig 4-Pack Family Figures. 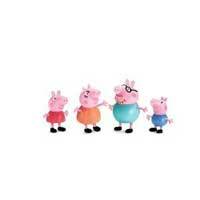 These articulated figures include, Peppa Pig, George, Mummy Pig and Daddy Pig. 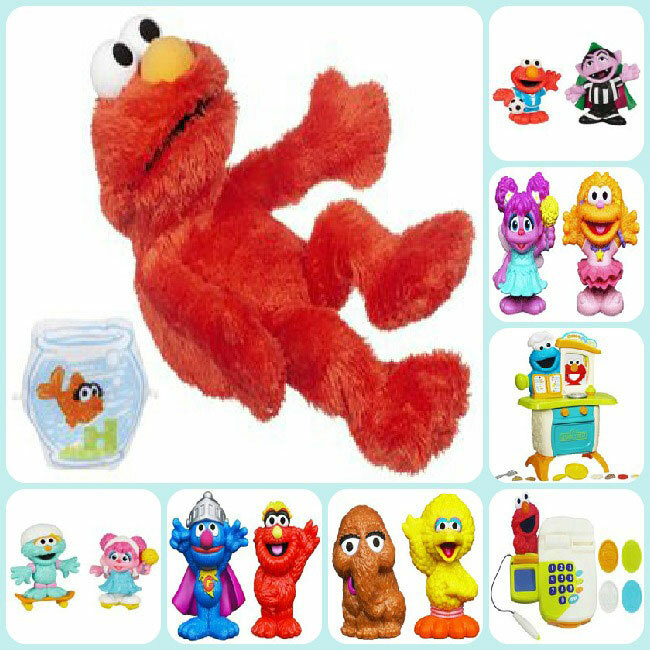 Each figure features unique clothing colors. 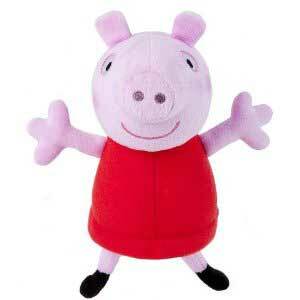 This adorable, soft, 9" plush is great for any Peppa fan! 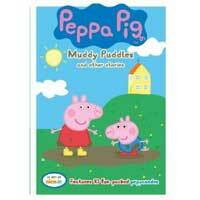 Full assortment includes Everyday Peppa, Muddy Puddles Peppa, Ballet Peppa and Everyday George. It’s almost Christmas, and Peppa Pig and her little brother, George, are mailing their letters to Santa. 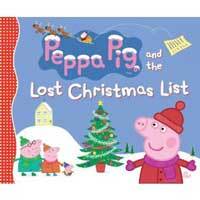 All of Peppa’s friends are there, too, and each one tells Peppa the special gift on their list. Peppa is excited to help Daddy Pig and Mummy Pig pick out and decorate their enormous tree, and she can’t wait for the big day to arrive. But little does she know that a surprise is in store on Christmas Eve, and that she may play a part in saving the day! 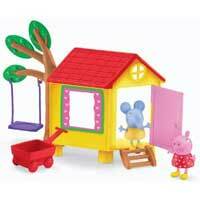 The colorful treehouse playset includes figures of Peppa and her friend, Emily Elephant, and features a purple swing and peek 'n surprise playset pieces. Flip the red wagon to fill it with cheerful flowers and switch the mat from a picnic to hopscotch. Disclosure: I received a Peppa Pig prize package in order to facilitate my review. No other compensation was received. This product review is based on my own personal experiences with this item and is completely honest and objective.